Donation made on behalf of Daniel Kane, president of the CarePoint Health Foundation and chairman of the board at Bayonne Medical Center. 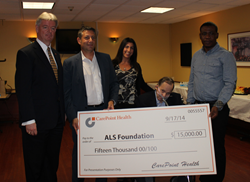 Leaders from CarePoint Health presented the ALS Association with a check for $15,000 on October 1, 2014, at Bayonne Medical Center. The donation was part of CarePoint Health’s participation in the Ice Bucket Challenge, where 150 CarePoint Health employees gathered to raise money and awareness for the ALS Association. The Ice Bucket Challenge and the $15,000 donation were dedicated to Daniel Kane, Chairman of the Board of Directors of both Bayonne Medical Center and the CarePoint Health Foundation and former CEO of Bayonne Medical Center, who was recently diagnosed with ALS. Mr. Kane, along with Mark Spektor, current President and CEO of Bayonne Medical Center, and Allyson Miller, Vice President of Marketing and Business Development, were on hand to present the check to John Nolan, Chief Development Officer at The ALS Association Greater New York Chapter. The Ice Bucket Challenge took place on September 9, 2014, when executives in the organization joined together with CarePoint Health employees to raise money and awareness for the ALS Association. Transportation was provided at each hospital location to and from Bayonne Medical Center. Specially made T-shirts, buckets, towels and refreshments were on hand for all participants. At the appointed time, a sea of orange-clad CarePoint Health employees waited for the signal and proceeded to dump buckets of icy water on their own heads. An audible scream of chill and delight rose from the assembled crowd, followed by laughter and congratulations. The employees then watched with delight as executives and the owners and of CarePoint Health, including Jeff Mandler, Vivek Garipalli, and Jim Lawler, barefoot and in business attire, were dunked with an equally cold soaking.